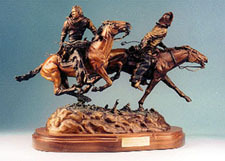 Depicted in this bronze are Butch Cassidy and the Sundance Kid, two of the most reckless and wild pardners to ever ride the outlaw trail. 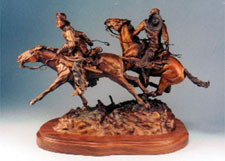 Their exploits of the late nineteenth century have filled many pages of western history, and now have become part of the rich folklore of the American West. It stands 16½" tall and 22½" long, and weighs approximately 38 pounds. It is mounted on a fine quality 2" thick American walnut base with a brass name plate.